Sister Jean Dolores-Schmidt has offered up pre-game prayers and courtside advice for nearly 25 years. Now she’s helping Loyola-Chicago advance in the 2018 NCAA tournament. This year’s NCAA March Madness tournament has already proven to be full of surprises and upsets. While University of Maryland-Baltimore's win over No. 1 Virginia made headlines, another team has snagged two unexpected victories ... thanks to a little help from a spiritual coach of sorts. After a 33-year absence from the tournament, No. 11 Loyola-Chicago will enter the coveted Sweet 16 or regional semi-finals, next week. 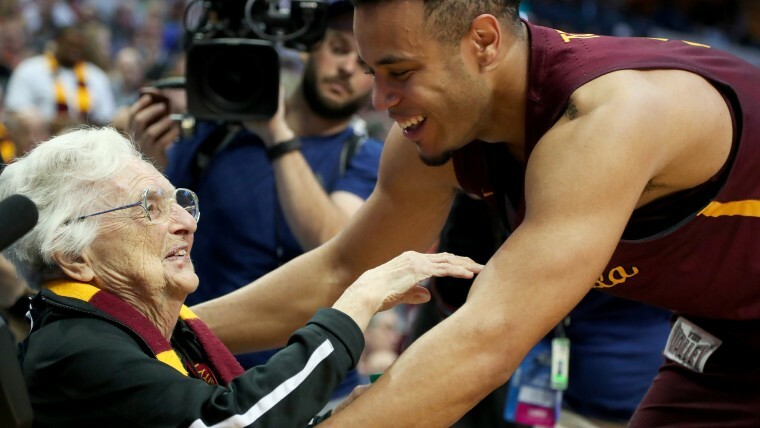 The team attributes much of their success to 98-year-old team chaplain Sister Jean Dolores-Schmidt. The active nun taught elementary students for more than 20 years and served as an academic adviser and campus minister before joining the team as chaplain in 1994. Dolores-Schmidt, affectionately known to many as "Sister Jean," leads the team in a pre-game prayer before each match. With her own basketball experience, (she played at her San Francisco high school in the 1930s) she’s able to add some technical insight, too. The beloved chaplain joins the Ramblers at nearly every home game, and unsurprisingly, has been courtside for the team’s victories in Dallas. In the first round of the tournament, player Donte Ingram made a game-winning 3-pointer to upset No. 6 Miami. Then, the team garnered a surprising one-point victory over Tennessee to advance to the regional semi-finals. "Thank God," Sister Jean told truTV. "We knew we would do it. Our team is so great." "They don’t care who makes the points, as long as we win the game," she said of the players. Next up, the team will face the winner of Nevada-Cincinnati’s game. In her “Cinderella dream,” her team just might make it all the way to the Final Four. Regardless of the tournament’s outcome, she’s just happy to be along for the ride.